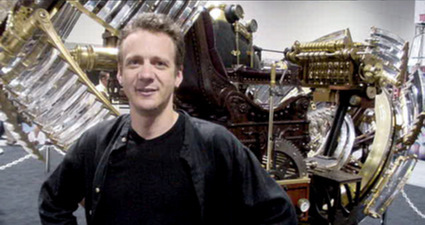 Simon Wells is an animator, storyboard artist, and director who is also the great grandson of famed author H. G. Wells (The Time Machine, The Invisible Man, The War of the Worlds). Simon studied audio-visual design at the Perse School and De Montfort University in England. After graduating, he went to work at Richard Williams’ studio, animating commercials and other projects. Wells would eventually become the supervising animator on Robert Zemeckis’ Who Framed Roger Rabbit. His success with that project led to his hiring at Amblimation, Steven Spielberg’s animation studio. Wells’ first project there was directing the sequel to 1986’s An American Tail. After directing two more animated features for Amblimation, the studio was closed down and Wells would be hired by Dreamworks (a new company co-founded by Steven Spielberg). Wells has served as a storyboard artist for most of Dreamworks’ animated films, and even got to direct one. For this installment of Animation Corner, I’ll be focusing on Wells’ only two good animated films, An American Tail: Fievel Goes West and the Oscar-winning The Prince of Egypt (now celebrating its 15th anniversary). 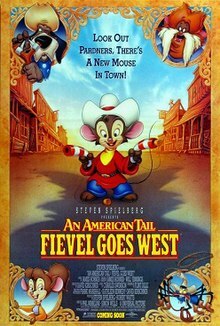 Co-directed by Wells and Phil Nibbelink, 1991’s An American Tail: Fievel Goes West centers on a Jewish-Russian mouse named Fievel who becomes separated from his family as they are emigrating from New York City to the Wild West. With the help of his best friend (a cat) and an aging sheriff (a dog), Fievel races to save his family and fellow mice from the conniving Cat R. Waul and his followers. Featuring the voices of Phillip Glasser, Dom DeLuise, Cathy Cavadini, John Cleese, Amy Irving, Jon Lovitz, Nehemiah Persoff, Erica Yohn, and James Stewart, this underrated film received a mixed critical reaction at the time of its release, but has fared better over the years. It grossed $22 million domestically (and another $18 million internationally for a worldwide total of $40 million). It is considered a box office failure, although it might’ve fared better had it not been released on the exact same day as Disney’s Beauty and the Beast. This film was the first animated feature made by Amblimation. Don Bluth, who had directed 1986’s An American Tail, was set to direct the sequel, but creative differences led to his quitting the project. Executive producer Steven Spielberg brought on Wells and Nibbelink to direct the film, resulting in an animation style that differed from the first film. This film was also the final theatrically-released film to feature James Stewart (who voices Sheriff Wylie Burp). James Horner, who scored the previous An American Tail film (and earned a Best Original Song Oscar nod), returned to score this film, adding new motifs and a Western style to the score. Among the film’s accolades are a Golden Globe nod for Best Original Song (for the song “Dreams To Dream”). 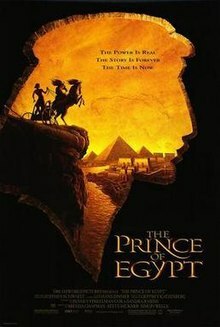 Co-directed by Wells, Brenda Chapman, and Steve Hickner, 1998’s The Prince of Egypt centers on Moses, a prince of Egypt, as he discovers his true Jewish background and, while in the desert, encounters God, who tells him of his destiny to lead the Jews out of Egypt back to their homeland. Featuring the voices of Val Kilmer, Ralph Fiennes, Jeff Goldblum, Michelle Pfeiffer, Sandra Bullock, Patrick Stewart, Danny Glover, Helen Mirren, Steve Martin, and Martin Short, this critically acclaimed film cost $70 million (the most expensive animated film up until that time) to make and grossed $101 million domestically (it added another $117 million internationally for a worldwide total of $218 million). The film actually originated a few years earlier when executive producer Jeffrey Katzenberg (who was still working at Disney) wanted to make an animated adaptation of The Ten Commandments, but was rejected. When Katzenberg joined Dreamworks, the idea was resurrected and given the go-ahead. This film is only one of a handful of traditionally animated films made by Dreamworks before they switched completely over to computer animated films in 2004. A lot of research and artwork was worked into the film’s visual style so that it could truly be representative of Ancient Egypt. Stephen Schwartz was hired to write songs for the film, and composer Hans Zimmer arranged the songs before building his score on the themes established in the songs. Val Kilmer (who provides the voice of Moses) also provides the voice of God (similar in the way that Charlton Heston had played Moses and voiced God in 1956’s The Ten Commandments). Among the film’s accolades are two Saturn Award nods, five Annie Award nods, two Grammy Award nods, two Golden Globe nods, and two Academy Award nods (including one win for Best Original Song for “When You Believe”). This entry was posted in Animation Corner and tagged Academy Award, Amblimation, Amy Irving, An American Tail, An American Tail: Fievel Goes West, Ancient Egypt, Annie Awards, Beauty and the Beast, Best Original Song, Breanda Chapman, Cathy Cavadini, Charlton Heston, Danny Glover, De Montfort University, Disney, Dom DeLuise, Don Bluth, Dreams To Dream, Dreamworks, Erica Yohn, Golden Globes, Grammy Award, H.G. Wells, Hans Zimmer, Helen Mirren, James Horner, James Stewart, Jeff Goldblum, Jeffrey Katzenberg, John Cleese, Jon Lovitz, Martin Short, Michelle Pfeiffer, Moses, Nehemiah Persoff, Oscar, Patrick Stewart, Perse School, Phil Nibbelink, Phillip Glasser, Ralph Fiennes, Richard Williams, Robert Zemeckis, Sandra Bullock, Saturn Award, Simon Wells, Stephen Schwartz, Steve Hickner, Steve Martin, Steven Spielberg, The Invisible Man, The Prince of Egypt, The Ten Commandments, The Time Machine, The War of the Worlds, Val Kilmer, When You Believe, Who Framed Roger Rabbit?. Bookmark the permalink.